The National Tsunami Warning Center tweeted that a tsunami is "not expected." PORT HARDY, British Columbia — Several powerful earthquakes have been reported near Vancouver Island, Canada, including a magnitude 6.8. The U.S. Geological Survey said several powerful quakes were reported Sunday evening. 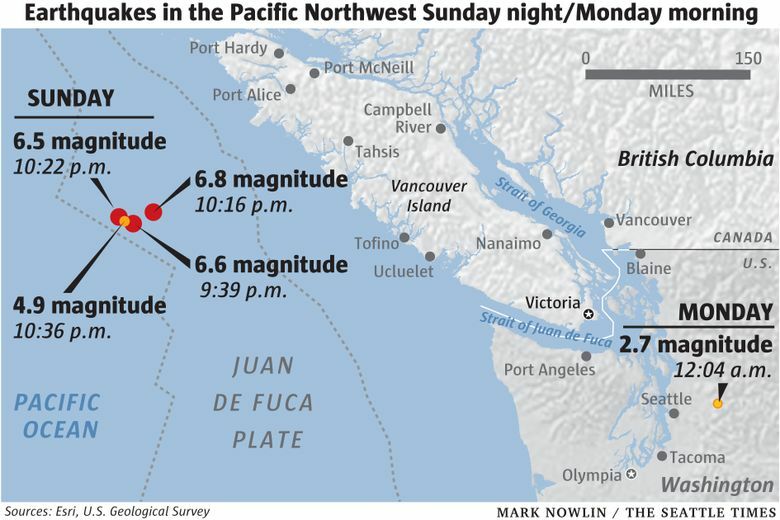 The depth of the largest was about 6 miles and it struck about 149 miles west of Tofino, Canada. Geophysicist Amy Vaughan said the three larger quakes ranged from magnitude 6.5 to 6.8 and that there were possibly some smaller ones as well as some aftershocks. Vaughan says the quakes were lightly felt onshore and that, as of now, no injuries were reported.